Today I'm revisiting an older Papertrey Ink stamp set called Scattered Showers along with its companion set Scattered Showers Additions. 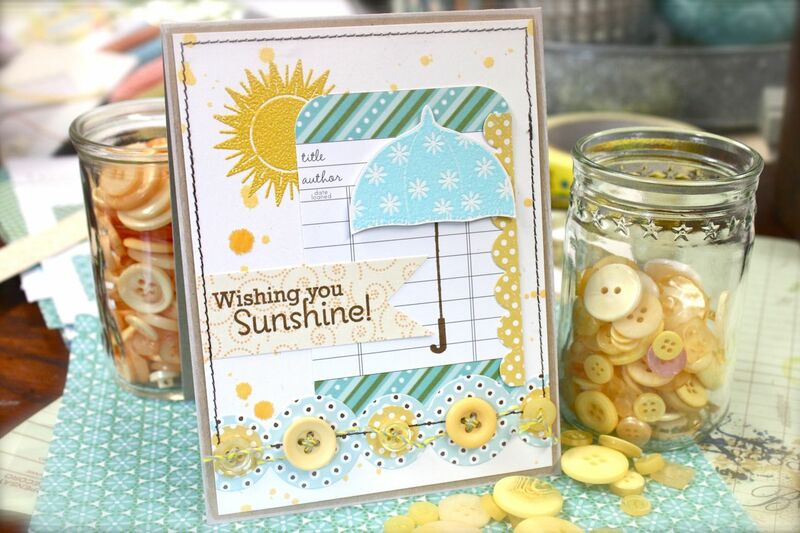 I love that the images and sentiments from both of these sets can be used for rainy day or sunshine-y types of projects. With all the storms we've had lately I thought a sunshine-y type card was much needed. 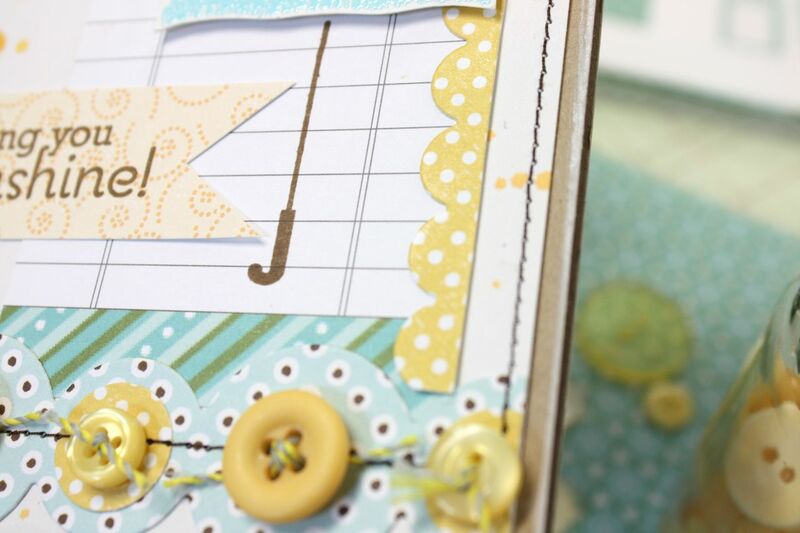 It's fun to pair our older Papertrey stamp sets with new products. Using embossing powder, I heat embossed both the sunshine image and the umbrella topper. A text block from Green Boutique was used at the base for the umbrella. For the sentiment I used the yellow swirl paper from Pretty Pastels, snipping the ends to form a notched flag. 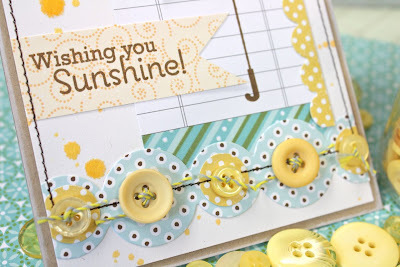 Along the bottom of the card I used one of my favorite border dies, Simple Circles. 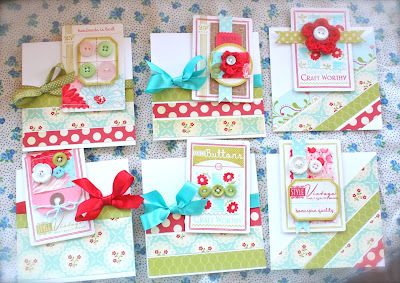 I punched smaller circles of patterned paper from my stash basket and then topped the circles with twine tied Vintage Buttons. 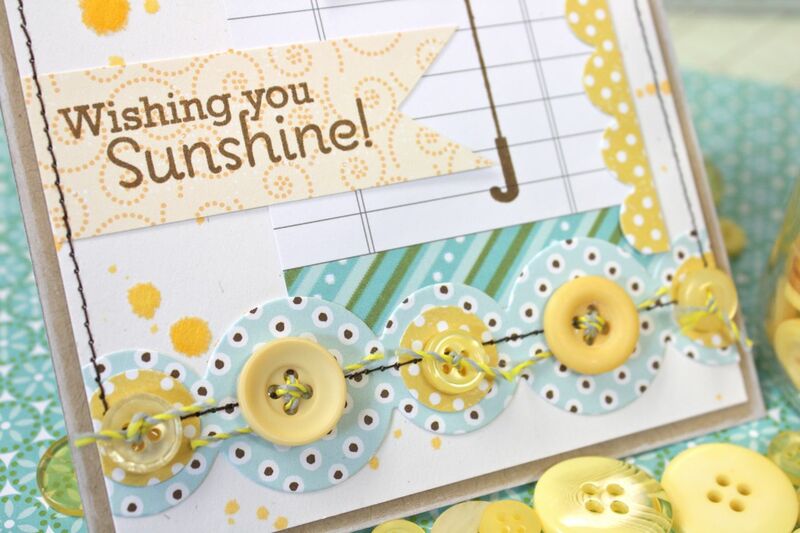 The base card of Rustic White was splattered with yellow spray mist. 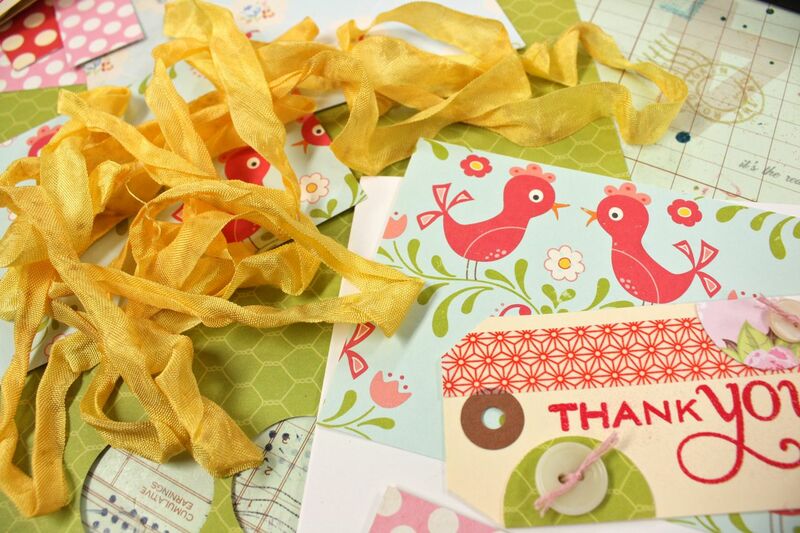 Brown machine stitching and small scalloped cut scraps finish off the card. 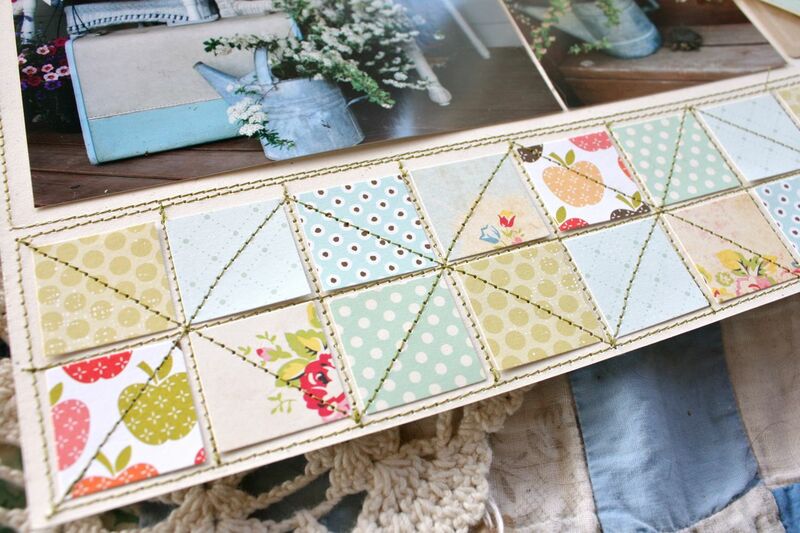 I love adding little snippets onto my projects that are just lying around on my desk. Hope you enjoy my new project. 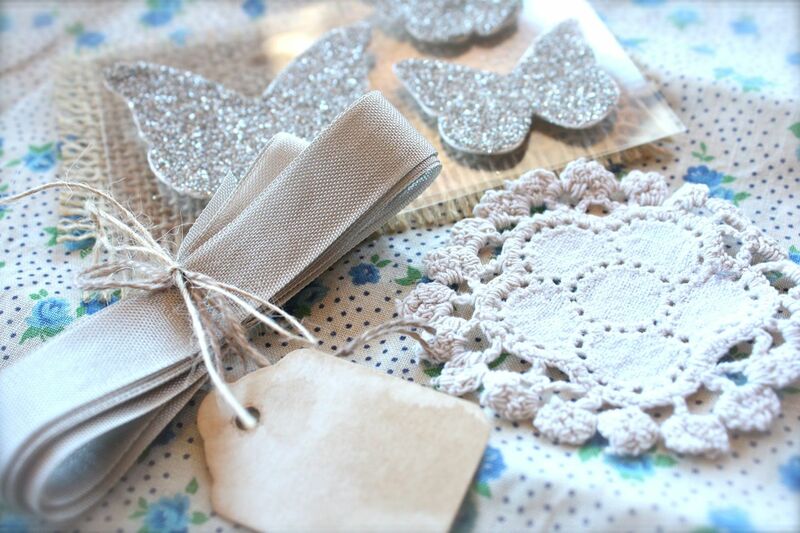 I found a few of my previous projects made from Scattered Showers that you can see here. New items going up in my Etsy shop today. All new items should be uploaded by 2pm Central time. Enjoy!! Hi guys. 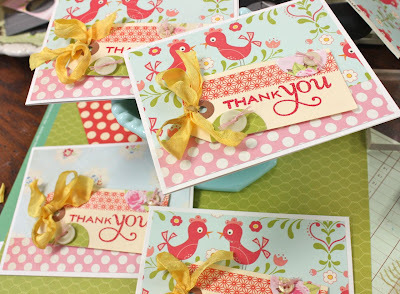 Decided to do a little doubling up on some thank you notes. Josey needs to send graduation thank you notes and I need to send birthday thank you notes. 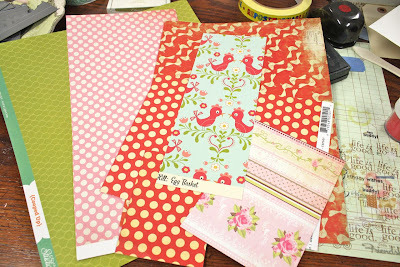 Here's what I had out on the desk so it looked good to me: papers from Studio Calico, October Afternoon and/or Cosmo Cricket (?) and The Girls Paperie. Using Medium Manila Parcel Tags I heat embossed a large thank you sentiment from Papertrey Ink using SU! 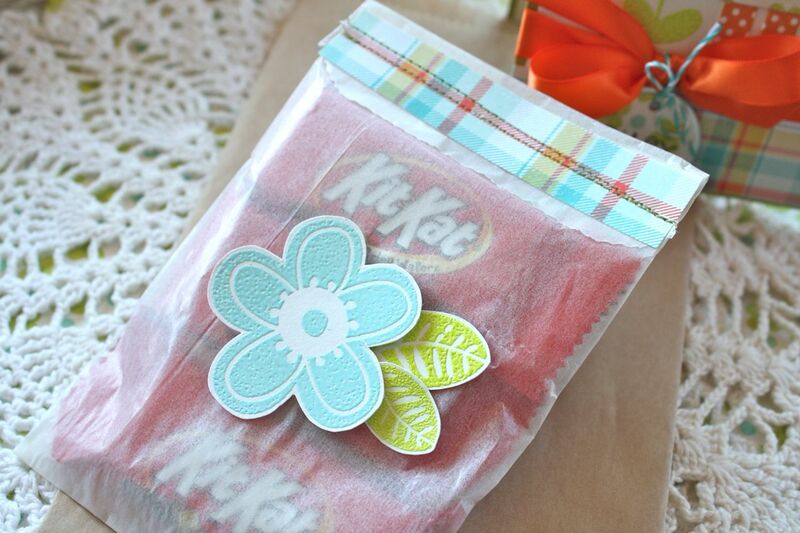 red embossing powder. Be prepared, Washi tape is my new favorite thing. 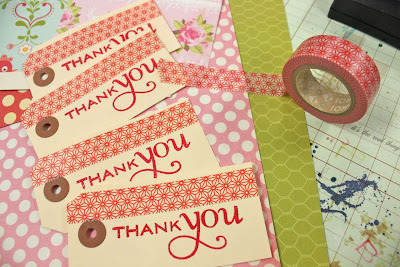 I added strips to the tags for some easy pattern + color. 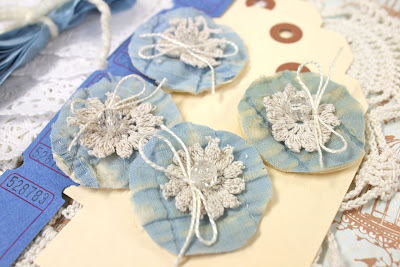 Using a circle punch and buttons + twine, I added a few additional embellishments to the tags. 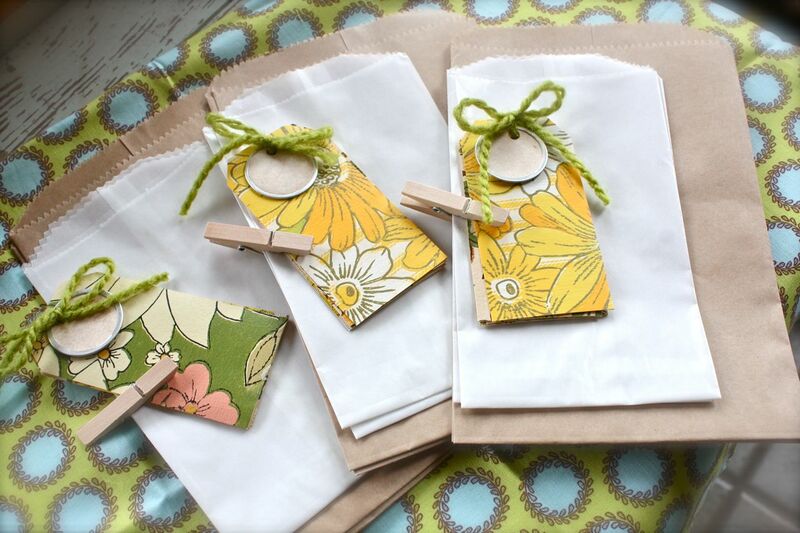 These would be great as is for little gift sacks. But I really need the cards so I cut up papers all mixy matchy style for my card fronts. I pulled some yellow Wrinkle Ribbon from my stash. 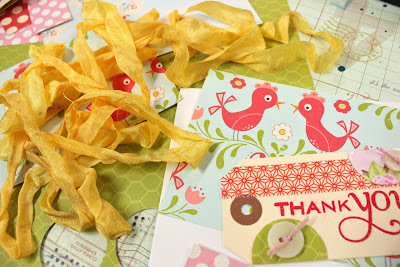 I chose the yellow because I spied a teensy spot of yellow in the flower centers on the patterned paper. You can zoom in closer on the photo below to see. 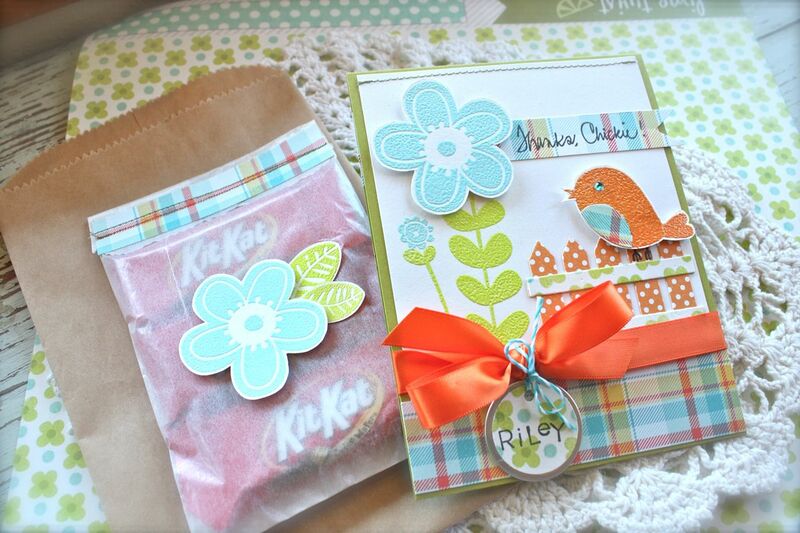 I tied the ribbon to the tags and adhered to my card front with pop dots. Easy peasy. 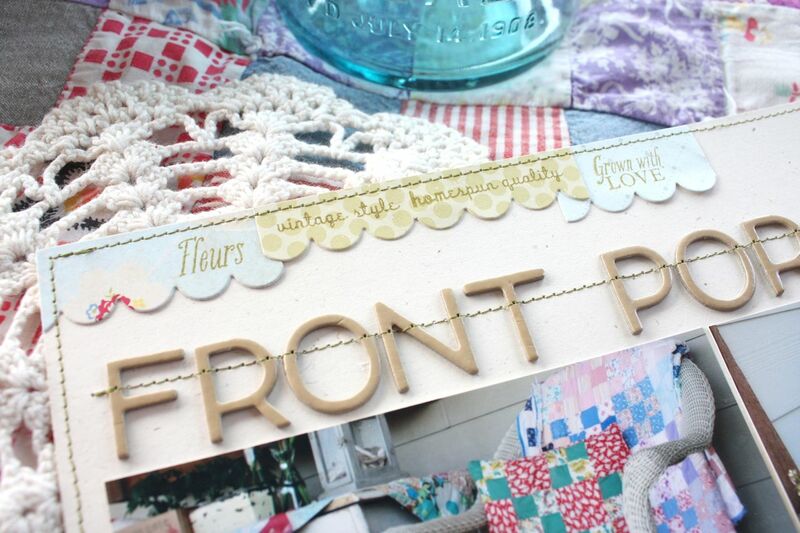 Love that the tags are so easy to reach for when you need a focal point on a card. 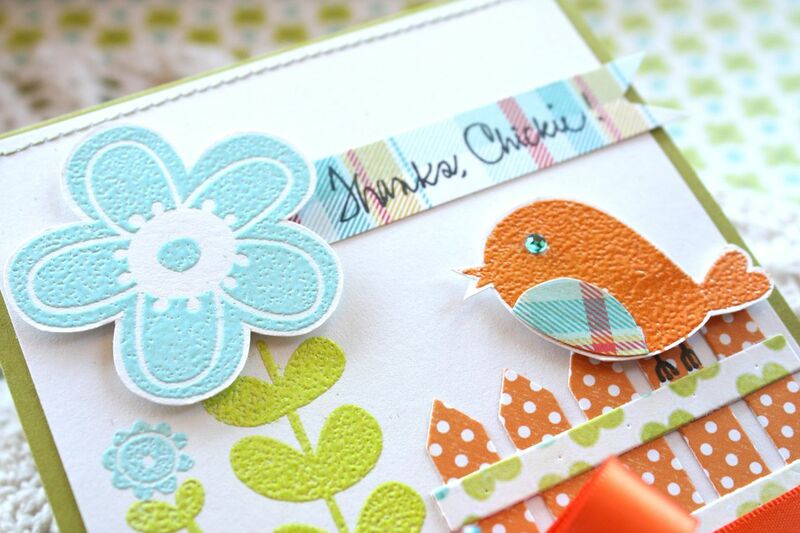 The raised surface of the embossed sentiment really helps to add dimension to the tag. 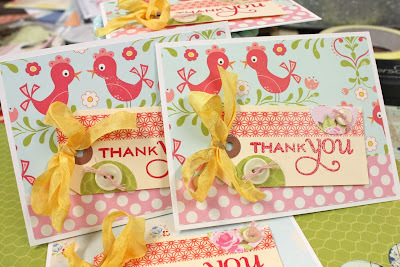 The entire series of Papertrey Think Big Favorites stamps fit nicely on the medium parcel tags too. A nice little stack of thank you cards, ready to be sent out. Think I'll go write my thank you notes right now. Hope you enjoy! Tomorrow starts a month long taxi service for me. Josey is embarking on her new role as a freshman, with all the events and camps that come along with it. Jordan is following closely behind with all of her summer activities too. June is jam packed for us....so much so that I had to make a weekly calendar to carry around just so we know if we're coming or going. I will be in the SUV so much that I think I need to pack a basket of things to work on/books to read while we're in between activities. Now if someone can just tell me how to handle suppers when we're out and about 4 nights a week + the weekends for softball. Here we go, folks!!! Come back on June 1st for the Papertrey Senior Design Team post. Hi friends. 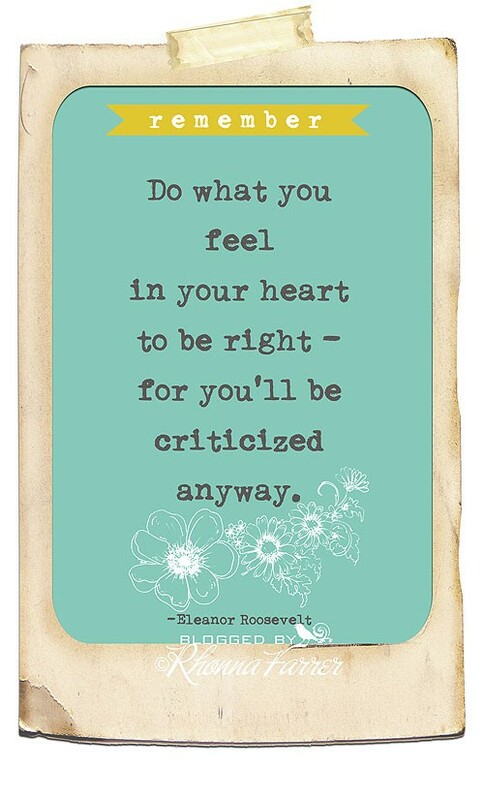 Today I have something special to share with you that is from the heart. 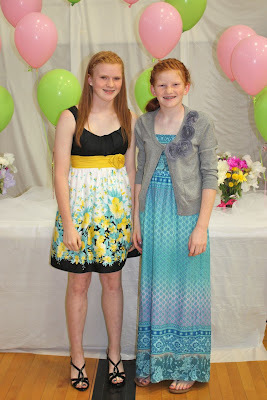 As you know if you've been following my blog, my dear Josey Posey graduated this year from 8th grade. She'll be 14 soon. She'll get her learner's permit to drive this summer. She'll be in high school next year. The photo below was one that Josey chose to be in the slide show that the 8th grade kids prepared for graduation. She and Jordy were about 4 and 5 years old here. One of my favorite photos ever. And here is a photo of Josey and Jordan from graduation night. They've grown up so much. Such pretty girls. Good girls too. A new favorite photo of my two reds. 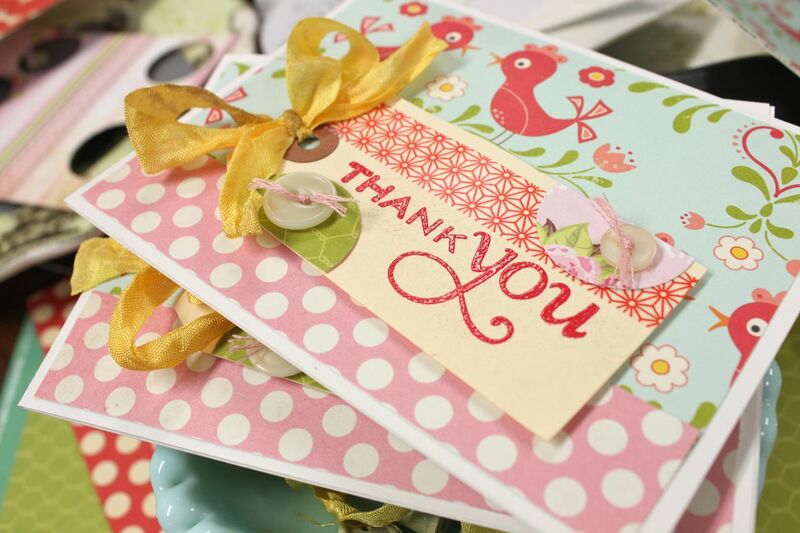 Lately I have recalled many comments that friends and family have made to me. Comments such as, "Don't you wish they were little again?"...... "Don't you wish you could make time stand still?"...... "Don't you wish they would just stop growing?" And my silent answer is a resounding, "NO!" I think about the girls being little again instead of young adults. I think about time standing still which would mean my girls would be 12 and 13 forever. I think about my girls never growing to see the big world that lies beyond our little part of the country. My family has been in the position where time stood still. It was the day my brother Jeff died. He was 17. Time froze. He never grew anymore. Today is Jeff's birthday. May 26th. He would have been 44 years old today. I wish he would have gotten that first car to call all his own. I wish I could have seen him graduate from high school. I wish I knew what he wanted to be in life. I wish I could play with his children. I wish he could be here to see my reds grow up and play sports. But I guess it wasn't meant to be. So with that I leave you with these thoughts: Wish for your kids to make it to another birthday. Wish for kids to see a bright and wonderful future. Enjoy the now moments. Capture them in photos. Pray that your children always keep growing. Happy Birthday Jeff! I miss you so much. Hi friends. Before I share my project for today I want to share some sad news from our community. Last night, tornadoes ripped through our area in Kansas. As we took shelter in our basement, we watched the weather reports as they announced that a fierce tornado was headed for a neighboring town about 15 miles from our house. The small town of Reading, Kansas was hit hard, leaving a demolished town and one fatality. You can see photos at this link. The grade school took major roof damage, homes were completely torn apart and the few businesses in town took major blows. Relief efforts from the Red Cross are taking place now. My husband is ready to move in Bobcats from his store to help in clean up efforts + the entire community is just waiting for the word to help out in any way we can. We are left feeling so thankful that our family and home and safe and sound.....but yet so distraught about our neighboring town and families. Please keep the town and residents of Reading, Kansas in your thoughts and prayers. On a more cheerful note, I needed something to keep my mind busy this morning. Josey received a darling little graduation gift from a friend at school and a thank you card was in order. I created this fun card and treat sack ensemble. 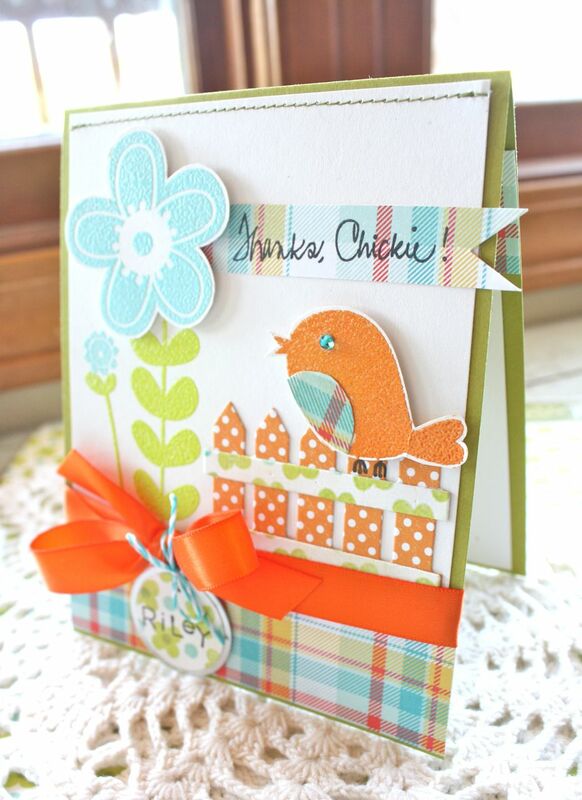 This cheerful card uses a stamp set called Spunky Nature from My Cute Stamps, now available at 2Peas. I love to cut out their fun images + they were perfect for embossing too. 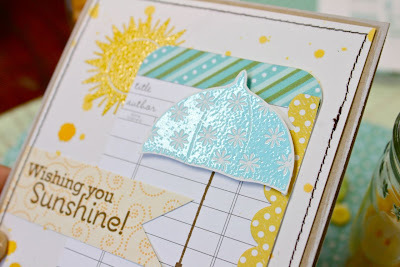 Sentiment is from Papertrey Ink along with fence die cut and ribbon. 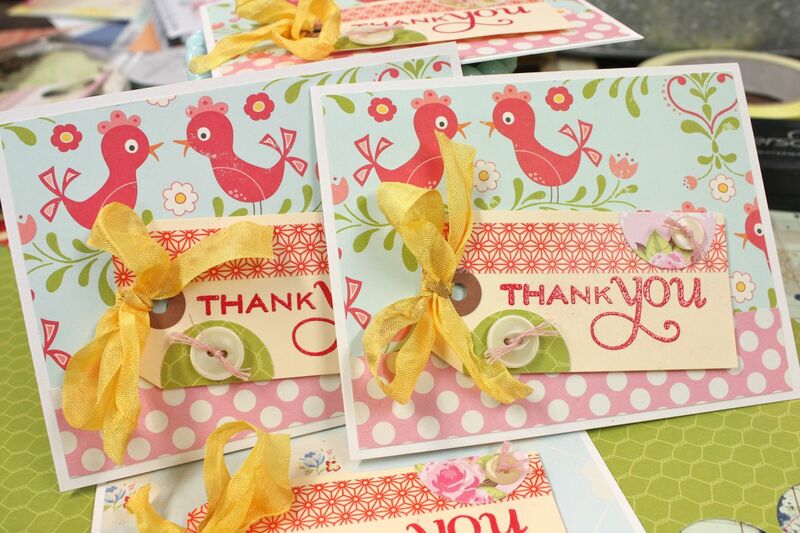 I love to personalize cards and gifty items for the girls' friends. 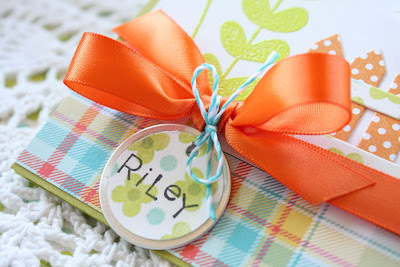 I used a small metal rimmed tag and spelled out Riley's name using Hero Arts tiny letter stamps. 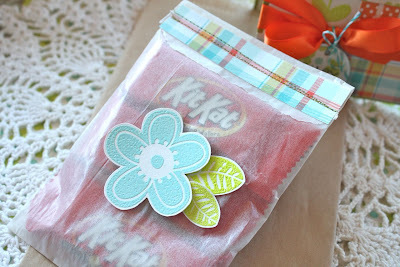 Using a medium glassine sack, I tucked in a few Kit Kats and stitched the sack closed with my sewing machine. A few extra embossed images embellish the sack. A few favorites on my birthday..
Hi friends. I've taken a few days after the Papertrey release this month just to re-group and wind down after a whirl wind of a month. The girls' last day of school is tomorrow...so today I'm soaking in the last few days of a quiet house. 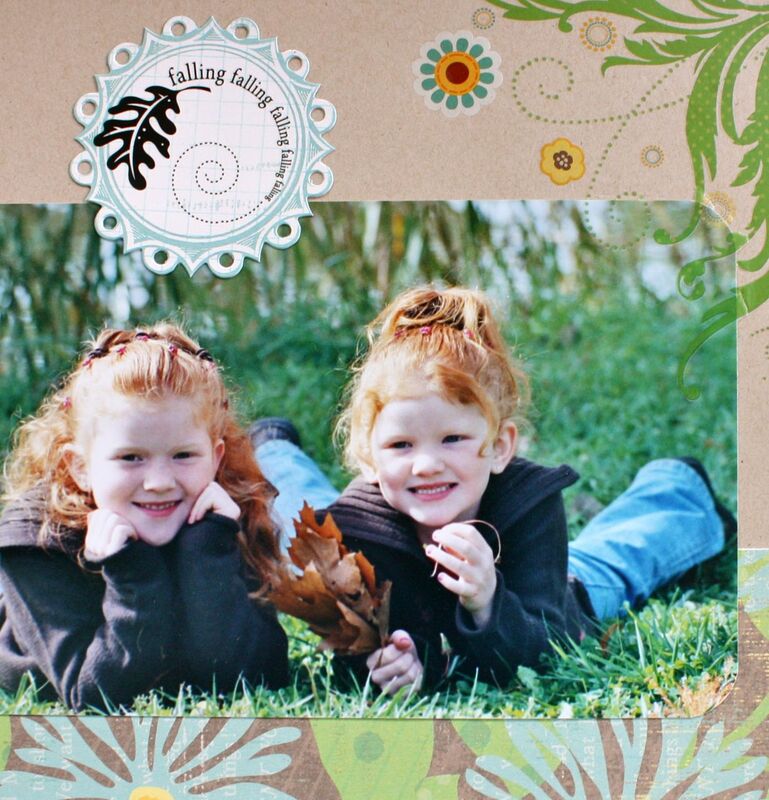 After that I am looking forward to having my girls at home for the summer. I LOVE having them at home all day. 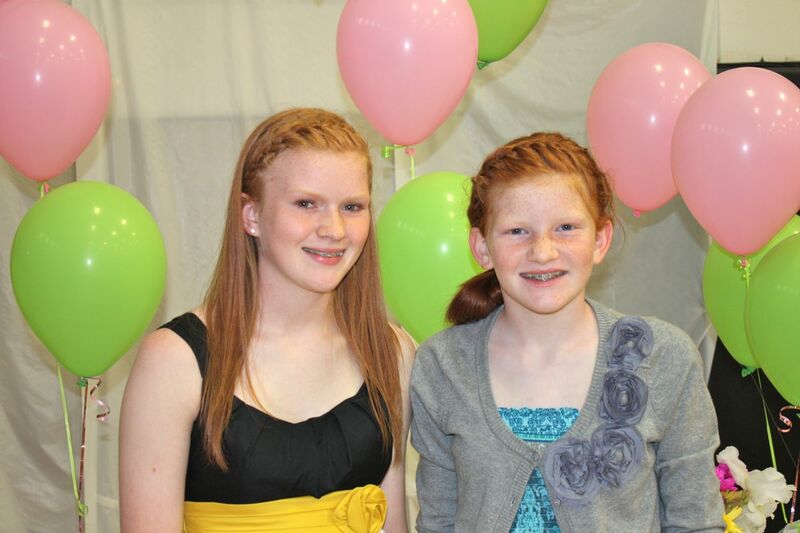 My favorite redheads. 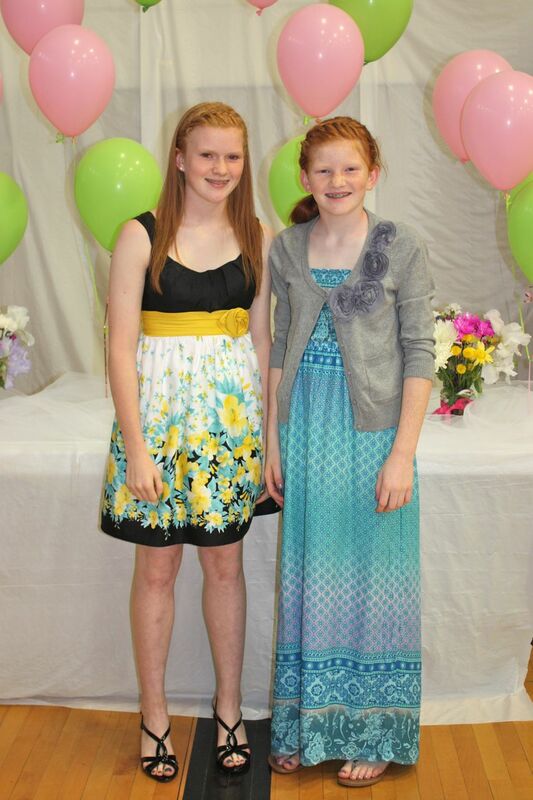 Josey and Jordan at Josey's 8th grade graduation last week. I am so proud to be their mother. No short shorts or heavy eye liner needed to show their outer beauty. Only an *I love you, Mom* needed for me to see their inner beauty. Now a few favorites from my Pinterest site........so many to choose from. All photo credits are linked on my pins at my Pinterest site. 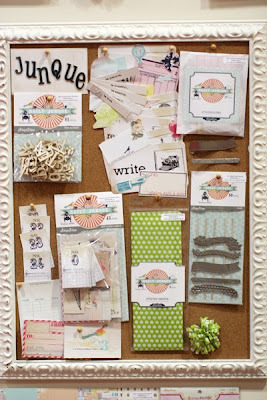 From my organization board.......a wonderful framed corkboard for visual inspiration. From my vintage finds board......a pretty Jadeite green cart filled with pretty papers. 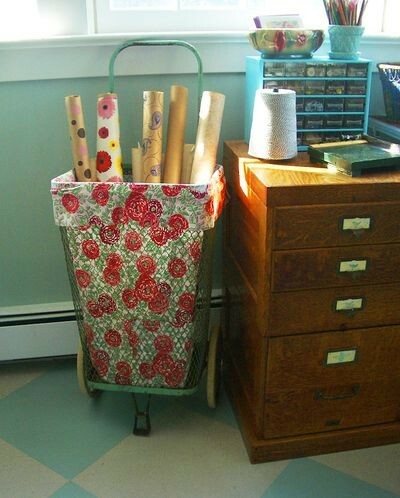 I am hoping to make a liner for a few of mine soon and fill with vintage wallpaper rolls that I've been collecting. 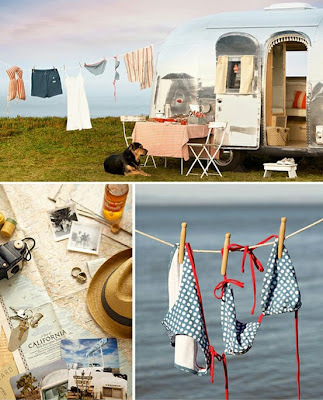 From my airstream love board....oh how I would love an airstream camper, complete with vintage finds, cute table settings, old quits...and a dog. :) To fit in that bikini would be nice too! 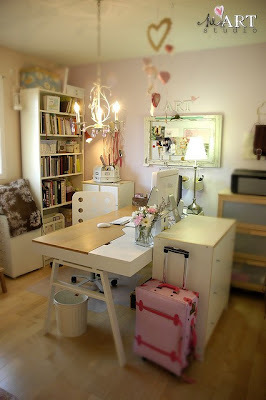 From my crafty spaces board.....a lovely crafty studio with soft lighting....and uncluttered. 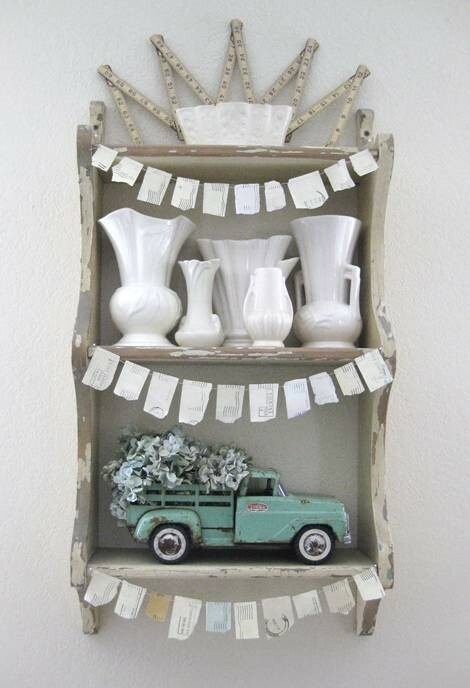 From my paper crafting board........this wonderful display with vintage ruler, milk glass vases, that to die for truck, and a garland made from old postage marks. From my blog board.....a softy and shabby card complete with lined envelope + small note with clothespin. I need to send more cards, how about you? 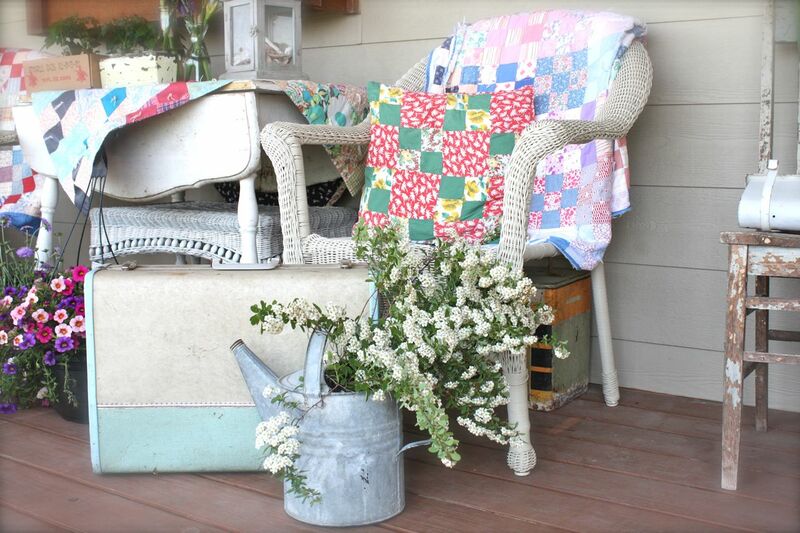 From my tablescapes board.....an old wooden table table covered with lace linens, mixy match chairs, flowers and garlands of vintage handkerchiefs. 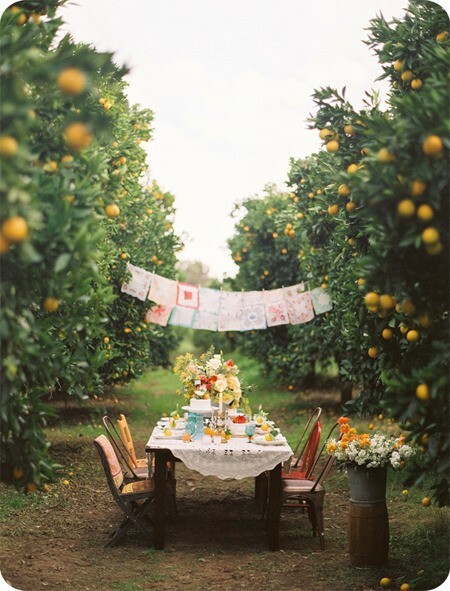 Wouldn't you love your fresh squeezed orange juice to come from here? 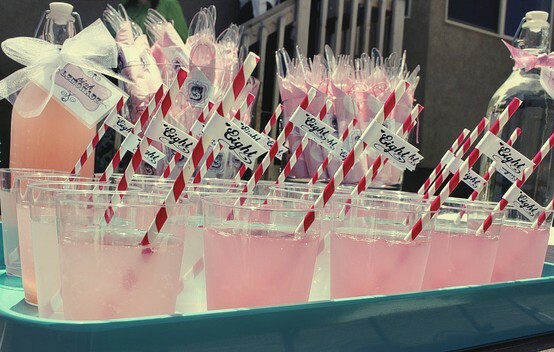 From my food finds board....pink lemonade with all the fixin's. 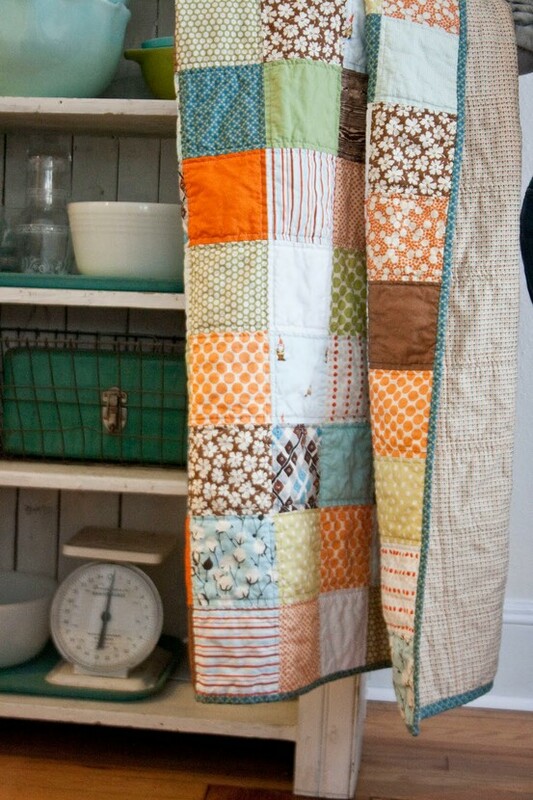 From my simply sewing board....quilts and more quilts. Definitely on my list of to do items for the summer. 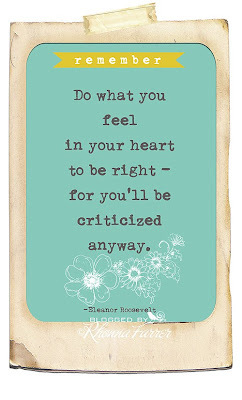 From my quotes and sayings board....I've been going back to this one a lot. Seems there are people everywhere that like to knock others down. From work, from the girls' school, from life in general. I guess it takes all kinds to make the world go round. From my scrapbooking board.....wonderful page layouts from the most creative people ever. 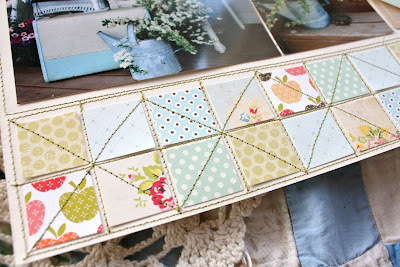 I'm loving these page starters from Sassafras lately. From my Project Life board.....still going strong, still loving it. 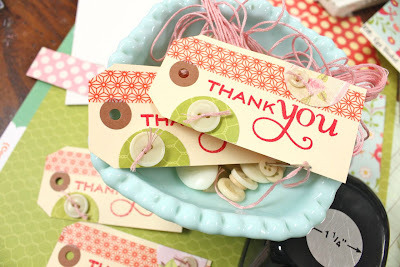 This simple little sucker wrapper from Lisa Truesdell's pages just melted my heart. Wouldn't you love to be able to touch a sucker wrapper from when you were a kid? 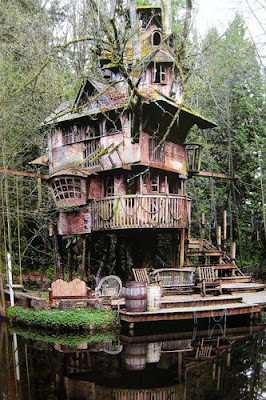 From my pretty little places board...... to walk through the woods and find this?!! Makes me want to build something out of nothing with the girls in the back timber this summer. Maybe a cute fairy house would be more our scale. And lastly my favorite thing said to me today...Eric called to ask what I was doing for my special day. I told him I was working on my Project Life album. He replied something like this...."You know, that's pretty special what you do. 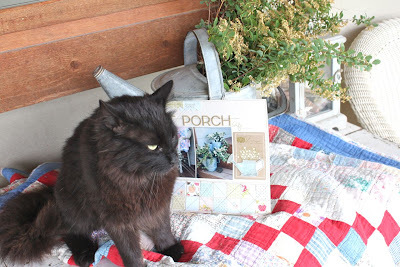 To see all the scrapbooks you had laid out for Josey's graduation party was really neat." And that is why I scrapbook, friends. I hope you all have a great day and an AWESOME summer. I'll be back into my crafty goodness really soon so stay tuned to some fun projects, new Etsy items and some fun new features on the blog. 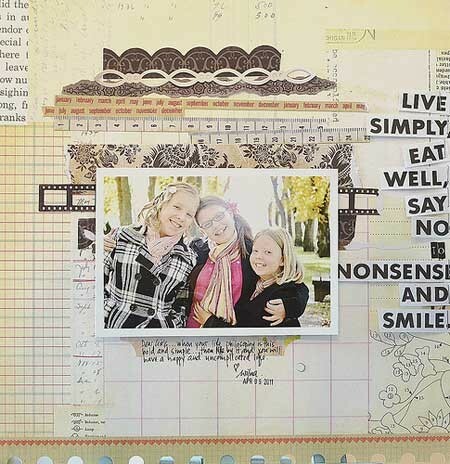 Hi everyone and welcome back to the second Papertrey Group Post by Nichole and the Design Team. 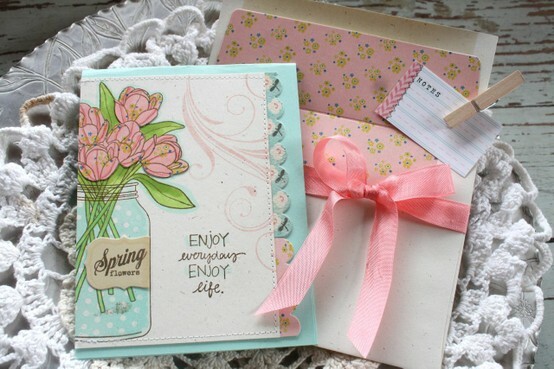 Today we're featuring the new Garden Variety stamp set along with the Year of Flowers Collection stamp set. I am head over heels smitten with the new Garden Variety stamp set. Each and every stamp and sentiment just fits into my life. 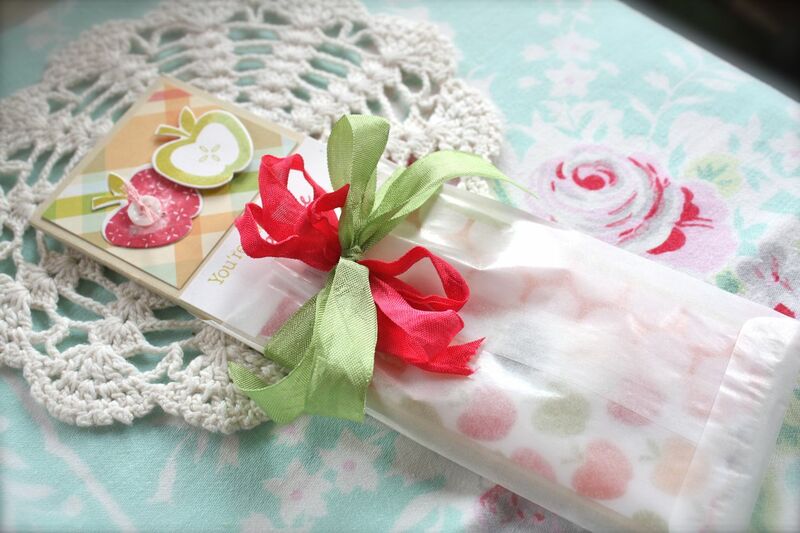 Love it so much and I hope you will too! 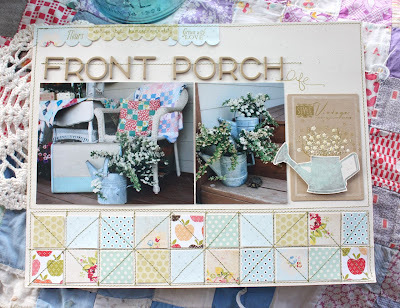 Since the focus of my project took place on our front porch, I ventured out there to photograph my scrapbook page I did for today. But once again, a curious kitty named Ben wanted to be front and center. So I moved inside for my photo shoot. :) I do have these photos to share from Josey's graduation weekend that were my inspiration for today's project. Time was short for decorations but I knew it was a perfect weekend to do some front porch sittin'. 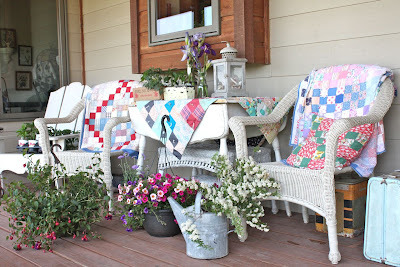 I grabbed a few vintage quilts to soften up the wicker chairs and threw a quilted tablecloth on the chippy white table. A few Iris from the flower beds and that was all that time allowed for decorations. 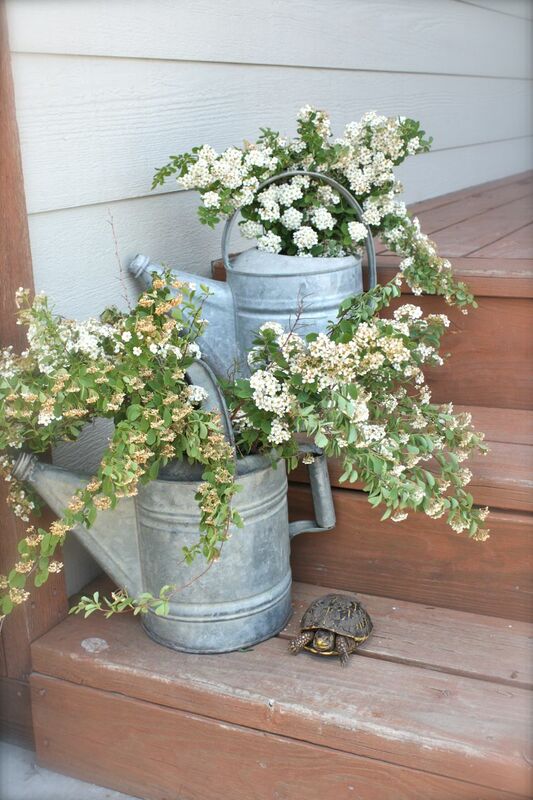 The Mother's Day plants and hanging baskets that I love so much started working way their way onto the porch as guests arrived for the gathering. Instant color. A typical scene on my porch includes lots of vintage watering cans. I have 4-5 that I sit here and there. 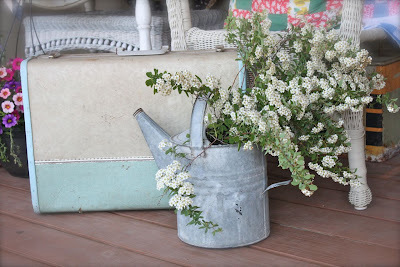 Some will hold fresh picked flower bouquets, some will have water in them for watering porch flowers and some get used to tie on seasonal decorations like July 4th flags, etc. For Josey's graduation weekend I didn't have many flowers from the beds yet to use as centerpieces. 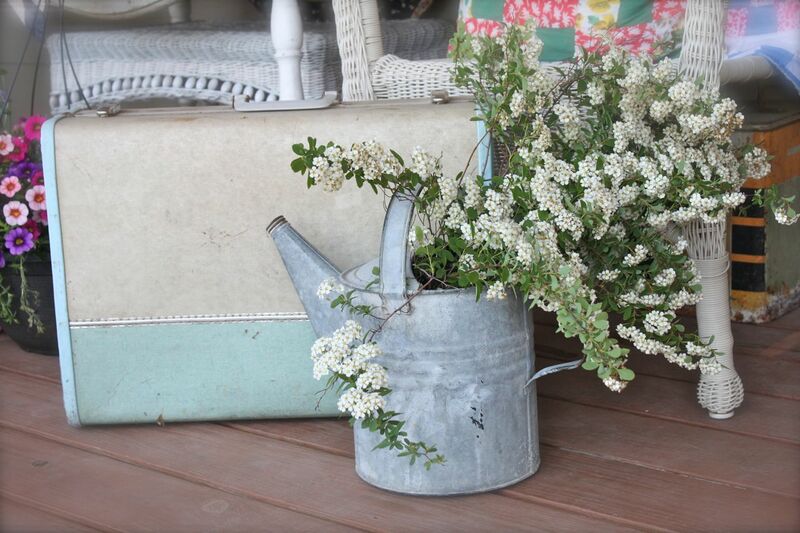 My mom snipped me giant bundles of white Spirea to fill my watering cans. This pretty can sits by my old suitcase that resides on the porch right now. It makes me think of an old friend that came to visit...or perhaps someone waiting for the train to come through town....or perhaps I keep it packed and ready to go just in case Dear Husband sends me packin' because I bought *one more* junky thing. 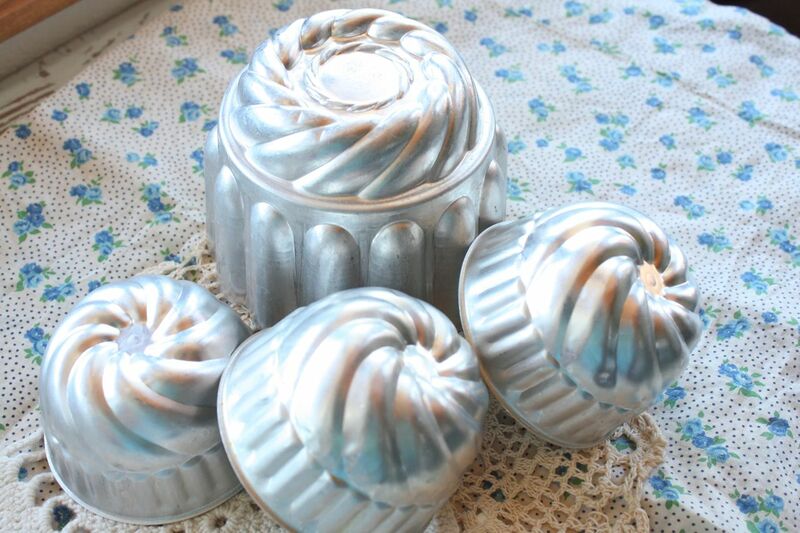 Whatever the case, I love my vintage finds. Here's a few watering cans that lined the front steps. 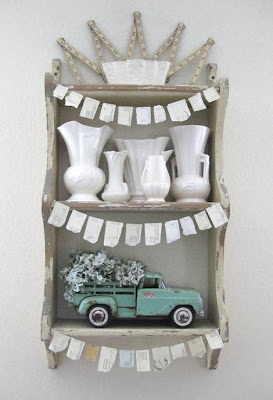 I just love the craftsmanship of old, found things. So lovely. And do you spy what I spy? Jordan found a friendly little turtle that was passing through the yard. We included him in a few photos before we set him on his way. And all those wonderful photos and memories of front porch sittin' bring me to today's project. I printed a few photos to use on a single page, horizontal, 8.5" x 11 scrapbook layout. The Garden Variety stamp set has a beautifully illustrated watering can so I knew it would work it's way into a scrapbook layout. For my main title I used Kraft colored chipboard letter stickers from American Crafts. I've seen lots of scrappers stitch the letters on lately. Love this idea as sometimes those stickers don't stay stuck forever. 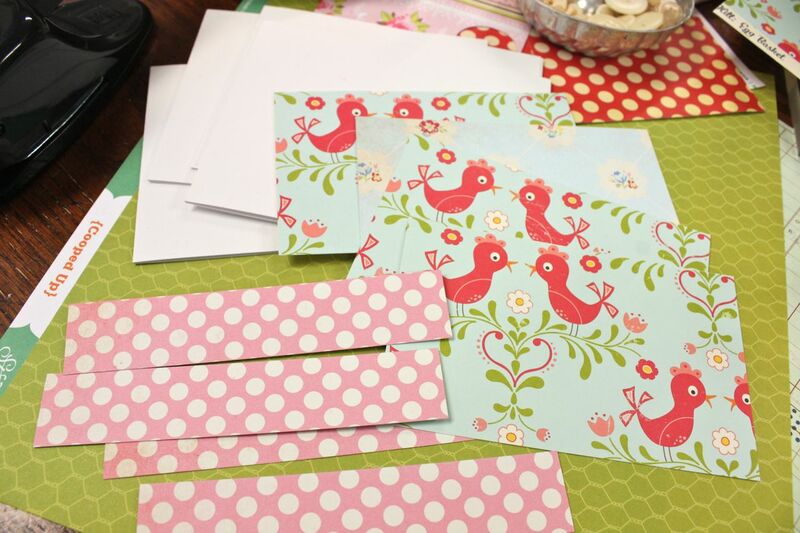 I used the Small Scalloped Border die to cut out several scraps of patterned paper. Sentiments from Garden Variety and Button Boutique are stamped on using Ripe Avocado ink. 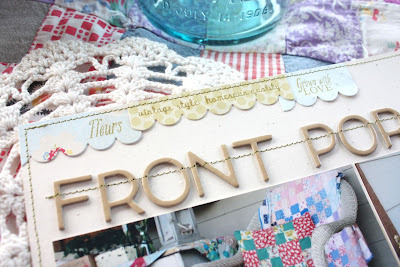 A machine stitched border in green runs all the way around my layout. 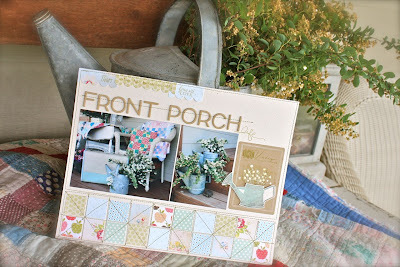 A fun focal point aside from my photos is a Button Card die cut adorned with a popped up watering can and stamped and embossed flowers that mimic the Spirea branches that were in my actual watering cans. 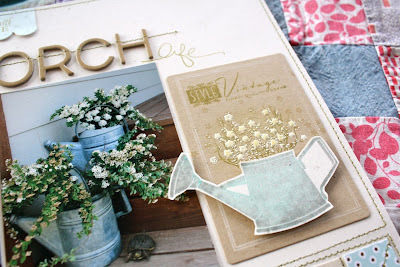 To create the galvanized, time worn look on the watering can I ink my stamp up with Aqua Mist ink. 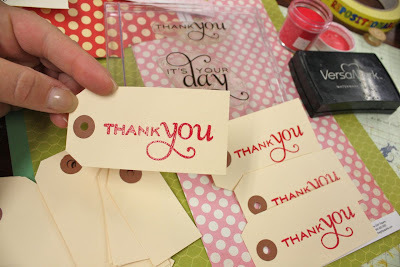 Then I tapped the inked stamp with Smokey Shadow ink. This gives that mottled look. Love how it turned out. For the flowers, I used a grassy looking stamp and a tiny flower cluster stamp that comes in Garden Variety. Other stamps from Button Boutique also embellish the Kraft button card die. Today I hand cut my watering can but there will be a watering can die + a few others that coordinate with Garden Variety. So happy about that. 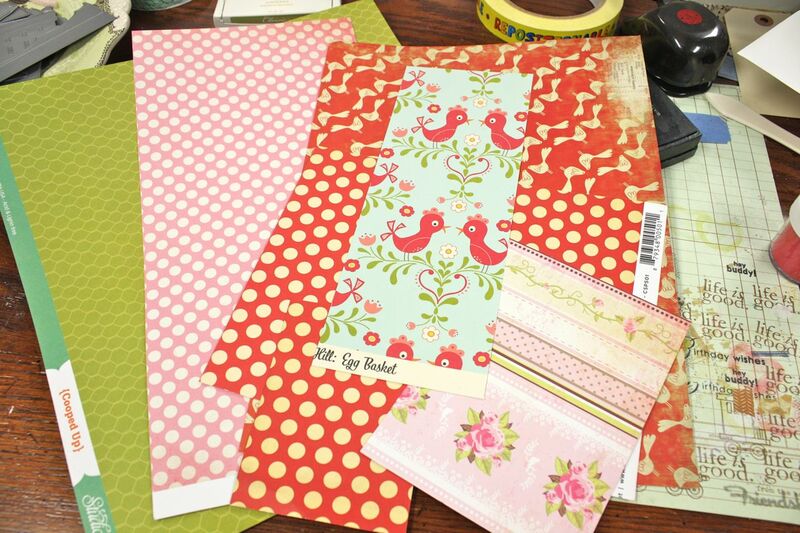 For the bottom portion of my page, I used a 1" square punch to punch out various patterned papers. I used my sewing machine to create a quilted look to match the quilts in my photo. So happy how it turned out.